Janet joined BND Commercial as part of the Goldstine Knapke acquisition in August 2010. She began her career in the mortgage loan department of Fort Wayne National Bank in 1967. 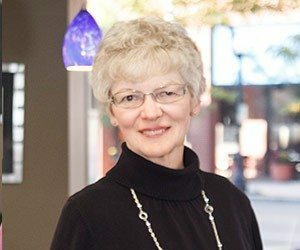 Janet has worked in the commercial real estate industry since 1982 and joined GK in 1988. She has assisted the same brokers for 28 years. A graduate of International Business College in Fort Wayne, Janet earned her degree in Secretarial Sciences. Janet is a member of the Amicitia Extension Homemakers Club. She has previously served the Huntington Extension Homemakers Organization at the county level and served on the Huntington County Extension Board as its president. She is a past district director for the Indiana Business and Professional Women’s Clubs and served on the Roanoke Library Board for 16 years. Janet was chosen as a recipient of the Golden Friend Award, given for service to the Roanoke Library as a member of the Friends of the Library organization. Janet and Dave, her husband of nearly 45 years, are attendees of The Chapel, where she has served in the area of missions support and been active on the discipleship team. They have one grown son, Chris, and two grandchildren. In her spare time, Janet enjoys baking, cross-stitching and spending time with family, friends and their two beagles.